The Nicolicious Rose™ The world’s finest roses are nurtured in the exotic landscapes of Ecuador. Where the snow capped volcanos rise dramatically up to six thousand meters, artisan horticulturalists nurture strong, vibrant, long stemmed roses, bathed in sunshine from dawn to dusk.! This is where Nico Tijsen selected to design and grow the Nicolicious Rose™, a symbol to celebrate his 25 years as Creative Director of Riviera Maison, and his roots in floral design. ! The unique Nicolicious Rose™ achieves both aesthetic refinement and design flexibility. 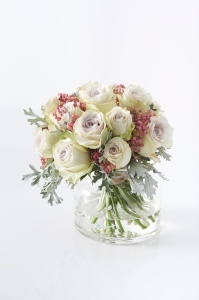 The petals are iridescent silver and gray, enveloping a gentle mauve heart. The scent captures the sweet and delicate roses of his mother’s garden from his childhood. Long stemmed with a generous flower, it is a stunning compliment to all interiors!